The Shoeless Joe first base mitt is a fair example of what differentiates the brand from its competitors. Many brands trump its latest styles and designs. 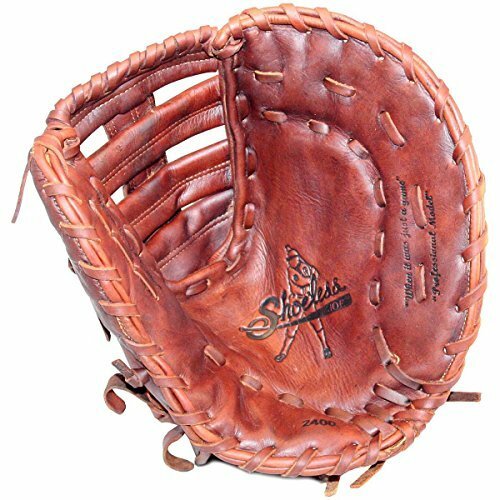 But the gloves from Shoeless Joe tend to revel in its faithfulness to traditional styling for gloves and mitts. It’s the reason why their brand comes from one of baseball’s legendary figures from almost a century ago. But that doesn’t mean that Shoeless Joe rejects modern innovation in glove technology. It’s true that some of their models evoke the styling of yesteryear, which has proven to work over the years. But they also have their Professional series of gloves and mitts that were produced through classic methods as well as through new techniques. 100% steerhide leather. Finished with Shoeless Joe's tobacco tanning process. XRD foam provides "Extreme Impact Protection". Deep pocket and single-bar web. Great for low or wide throws. Hand laced. Easy to break in. Size: 12". Model: 1200FB. This is the 12-inch model made with 100% steerhide leather which has been finished with the traditional tobacco tanning profess that Shoeless Joe developed over the years. The old time ingredients used for softening the leather are all rubbed in by hand, and it’s also been individually cut and sewn by hand. The way the mitt has been prepared makes it look already game-worn, which is actially a good thing for leather products. It doesn’t take long to break it in properly so that it molds with the shape of your hand perfectly. But it also features the modern XRD foam, which offers deep impact protection. It makes the mitt more durable, and it also protects your hand from pain and injury when you’re catching hard-thrown baseballs from the other fielders. This features a single-bar web along with a deep pocket so you can secure various types of throws. The open back also lets your wrist move more freely. You’ll be better able to deal with wide throws that you have to reach out for, as well as low throws that you have to dig up. It doesn’t take long to break in. It’s great for catching throws and fielding the position. The price isn’t all that high. You still have to break it in. The 12-inch size may be too small for some adult players. If the 12-inch model is a bit too small for you then this may suffice. But its size isn’t just the sole reason why you ought to get it if you play first base. It also has all the features you’d expect in Shoeless Joe gloves and mitts. Like many of these gloves, the Shoeless Joe Professional Series 1300fbtt First Base Mitt has been individually cut and sewn by hand. It uses the specially aged antique tobacco steerhide leather, with classic ingredients rubbed into the leather to make it feel softer. Because of the handcrafting involved in the manufacture, you get a unique glove when you buy this mitt. It’s also partially broken in, which accounts for why it already looks and feels as if it’s been used in games. This means it doesn’t need as much time to break it in properly. It will mold nicely with your hand soon enough. This is also features a more advanced design. It doesn’t just have a deep pocket and an open back for flexibility, but it also features the special Tennessee Trapocket Web. 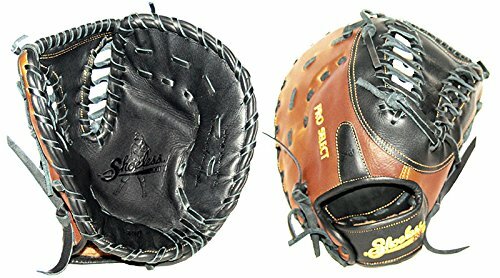 This web design is meant to help you catch various types of throws more effectively, and it also secures the baseball into the glove more firmly. It’s a modern type of web that somehow combines nicely with the classic overall design of a Shoeless Joe mitt. The price is still reasonable. It offers a new type of webbing that helps in securing throws to 1st base. It doesn’t take as long to break in. The open back is comfy and offers flexibility. It’s not for smaller players. You may need to get used to the webbing. This is more expensive than the other two, but that’s because it features the best attributes of the other mitts. It also has the Tennessee Trapocket Web Design that helps secure your catches, and you also get the XRD extreme impact protection padding system that keeps you from getting hurt catching all those throws. Once more it’s entirely made by hand, and it doesn’t contain any synthetic materials either. It’s made entirely of steerhide. It also comes with cowhide inner lining that makes it more comfortable for you to wear. This glove has the Pro Select leather laces that make it even stronger and more durable. It even has a 2-tone look that some people may like. It protects your hand very well. The mitt is designed to last for a long time. It can hold your catches firmly in the mitt. This may be too big for some younger players. It may take a while for you to break it in. There are good reasons why Shoeless Joe gloves and mitts are so highly regarded by players and coaches. Each of these gloves is unique, and they’re designed to fit and mold to the exact shape of your hand. They can offer modern features that improve your play, yet the makers use proven traditional handcrafting methods to make sure that each glove is made with proper care and precision. The customer service reputation of Shoeless Joe is excellent as well. In fact, when your glove becomes a bit too worn, you can send them to Shoeless Joe to be reconditioned. They will then treat it with the brands classic tobacco tanning material so that when it comes back to you it will feel and look like new again. If you’re playing first base, you can’t skimp on the quality of your mitt. You’re the last line of defense keeping hitters from reaching base. With the Shoeless Joe youth first base mitt, you can dig up and catch hurriedly thrown baseballs, and also field them yourself. It’s long-lasting and effective, and it’s a terrific brand to consider. 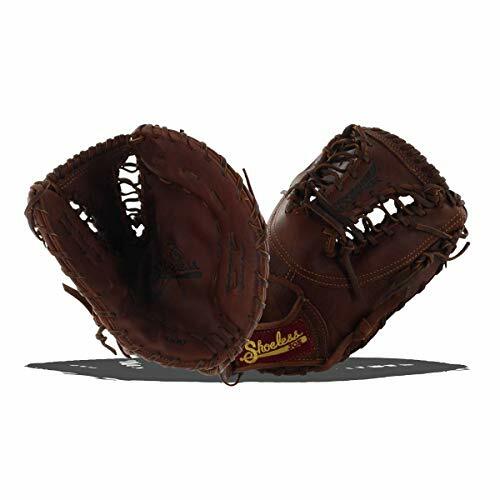 Try the Pro Select First Base Tennessee Trap Baseball Glove if you have the budget, as it’s very comfy, quite durable, and extremely effective. You can always check out other baseball gloves but I’m quite sure you’ll be pleased with a Shoeless Joe first base mitt.